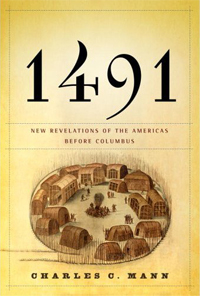 I just finished reading 1491 by Charles C. Mann, and I have to say, everyone should read this. Columbus discovery of the Americas changed the world, but until reading this book, I didn’t have any clue of the degree to which the world changed. Before reading it, the idea I had of the Americas that Europeans discovered was closer to that of the noble savage than anything else. In my old, incorrect, paradigm, the indigenous population was destroyed by the genocide of greedy conquistadors and similar violence. Instead, anthropologists now think that that the population of the New World rivaled that of the Old, but the people there lacked genetic diversity. An example of this would be the distribution of blood types. The A and B blood alleles were almost completely absent in Central and South America, so that the entire population had Type O blood. As a result of this homogeneity, the lack of exposure to contagious diseases like smallpox and the plague, and the resulting ignorance of how to use quarantine meant that disease decimated 90% of the indigenous population before they even saw an explorer. That information alone cast the native population in a new light. But this also means that the populations of the various fauna found in the Americas was much smaller than later observed. For example, the natives kept large animals like the bison a days journey from any village and kept their population under control. Another story of the fauna of North America is the passenger pigeon. It is now extinct, but John James Audubon recorded watching what must have been billions of pigeons passing overhead for three days straight. The bird was not seen in this magnitude because the indigenous people kept them in check. Finally, 1491 showed me that the foods from the Americas have become the staples of the world. Three of the top five staple foods that the world consumes — maize (corn), potatoes, and cassava — have their origins in the Americas. Mann asserts that the introduction of cassava into Africa made the later slave trade possible since it became the staple of choice in much of Africa. I haven’t even talked about how great the civilizations in America were — empires rivaling those of ancient Rome grew and thrived and then died out centuries before the first explorer showed up. In the past, some people have floated theories of ancient European colonizers to explain the unexpected sophistication that we found among the “noble savages”. So go get a copy of 1491. You won’t regret it.